Google is launching free public Wi-Fi at locations across Mexico. Initially, Google Station will be available in 60+ high-traffic venues across Mexico City and nationwide, including airports, shopping malls and public transit stations. Google plans to reach 100+ locations before the end of the year. Google already provides public Wi-Fi in India and Indonesia. 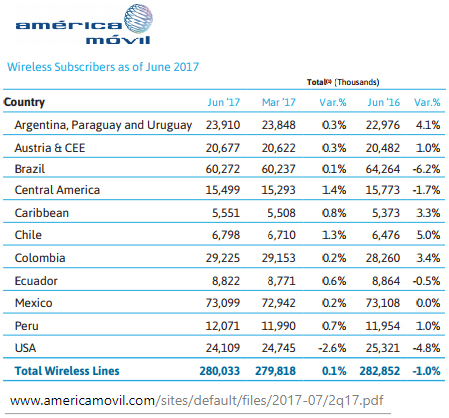 América Móvil, the Mexican telecommunications carrier with interests across Latin America and fourth largest mobile operator worldwide in terms of subscriber count, continues to travel along a familiar path – new subscribers in many markets are harder to find but surging demand for always-connected smartphones presents an opportunity to increase ARPU, which lags the consumer spend of developed markets. Competition across Latin America is fierce as reflected in the high subscriber churn rates. Carlos Slim Helú (77), who at times has been ranked as the world's richest person but who now holds the No.6 position on the 2017 Forbes Billionaires list ahead of No.7 Larry Ellison but behind No.5 Mark Zuckerberg, still sits on América Móvil's board of directors, but his son Carlos Slim Domit (50) now serves as chairman of the board. In recent years, the company has faced regulatory challenges in its home market, where it continues to hold the leading share, built new bases through its Claro brand throughout Latin America, and completed deep investments in Europe (a 51% stake Telekom Austria and a 21% stake in KPN Netherlands). In 2013/14, Mexico undertook a structural reform of its telecommunications sector, forcing América Móvil to sell off some or all of its Telmex wired assets in a process that is still underway. 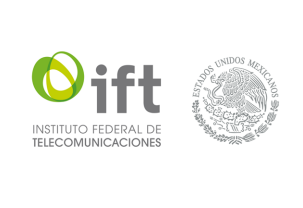 Discussions with the Mexican regulatory authority, IFETEL, on the legal separation of Telmex appear to be ongoing. The full effect of this reform perhaps will be felt next year, when a new wholesale, nationwide infrastructure provider known as Red Compartida (shared network) begins commercial 4G service. In late July, América Móvil published financial results and operational metrics for Q2. These provide insight not only into the company but also the Latin American telecommunications sector in general. Several macroeconomic issues, however, continue to impact the sector, including the tense situation and declining economy in Brasil, and the wildly fluctuating value of the Mexican peso (declining 28% versus the real, 20% versus the Colombian peso, and 8% versus the dollar with respect to the entire year). The company reports continued disconnection of prepaid subscribers in many countries, but a 5.1% net increase in postpaid subscribers, with Chile's increasing 17.8%, Brazil’s 10.0%, Colombia's 7.7% and Mexico's 6.4%l. On the fixed-line platform RGUs rose 1.1% from the prior year, with broadband accesses up 5.7% year-on-year after connecting 209,000 new accesses in the quarter, mainly in Central America, Colombia and Brazil. Colombia, Argentina, Chile and Peru were the main forces behind the strong expansion of service revenues. Outstanding debt declined from MXP 629.7 billion (approx. $35.2 billion) in December to MXP 550.8 billion pesos ($30.8 billion) in June, a 12.5% decrease, reflecting the company’s debt reduction efforts and the appreciation of the Mexican peso versus other currencies in the period. Approximately 21.6% of company revenues are U.S. dollar-based. ARPU in Mexico was MXP 137 pesos ($7.69), up 7.5% over last year, with churn at 4.1%; ARPU in Chile was CLP 5,826 ($8.96), up 6.9% over last year, with churn of 5.3%; ARPU in Colombia was COP 16,815 ($5.6), up 1.6% over last year, with churn of 4.3%. Earlier this year, América Móvil acquired 60 MHz of wireless spectrum in the 2.5 GHz band from Grupo MVS on undisclosed terms. The deal was approved in May 2017 by Mexico's telecom regulator. The 2.5 GHz spectrum gives América Móvil a similar spectrum position as Sprint, which recently published the results of a field trial using massive MIMO with 8T8R (8 transmit, 8 receive) radios in a 20 MHz channel in the 2.5 GHz band. The trial was conducted with Samsung and reportedly delivered peak speeds of 330 Mbit/s. Capacity per channel increased approximately four-fold, cell edge performance increased three times and the overall coverage area expanded compared with current radios. América Móvil may now be looking for a similar outcome for its newly acquired spectrum in Mexico. Coincidentally, in July, Samsung Electronics reached a framework agreement with América Móvil to supply 4.5G networking gear in Mexico and other Latin American markets. The deal also covers the development of IoT solutions and the use of Samsung devices such as the Galaxy S7Edge, the Galaxy S8 and the Galaxy S8+. In late July, a Colombian arbitration panel ordered América Móvil's Colombian affiliate, Comunicación Celular (COMCEL, operating under the Claro brand) to pay $1 billion in a dispute over ownership of network architecture. The case dates back to a contract signed in 1994 by COMCEL under which it was bound to return certain infrastructure to the state after a period of ten years. Movistar, the local affiliate of Telefonica, has also been hit with a $529 million fine for the same reason. The operators argue that they have continually upgraded the infrastructure over time and that new contracts and conditions have superseded the outdated agreement. Both carriers are expected to appeal. América Móvil has sought the intervention of the Mexican government, arguing that such a massive fine for such a dubious case will have negative repercussions between the countries. 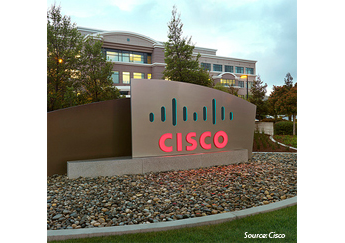 Cisco Mexico announced that it has developed the Country Digitization Analytics Platform (CDAP) designed to support the implementation of Mexico Conectado, a program of the Mexican government's Secretariat of Communications and Transportation (SCT). The Cisco CDAP platform is designed to provide the SCT with analytics information for usage of the initiative, in addition to raw data relating to the usage of the network. Mexico Conectado is a program initiated by Mexico's federal government that is intended to guarantee citizens constitutional right to access to broadband Internet service by addressing the digital divide in the country. The program was developed by the Mexican SCT and is being implemented through the department Coordination of the Information and Knowledge Society (CSIC, or Coordinación de la Sociedad de la Información y el Conocimiento). The key objective of Mexico Conectado is to extend broadband Internet access, free of charge, to low income populations via the deployment of more than 100,000 sites nationwide. The system is being implemented across Mexico, primarily in public locations such as schools, health centres, libraries, community centres, public parks and government buildings. The Country Digitization Analytics Platform is designed to offer an open government analytics and intelligence platform and was developed by Cisco engineers leveraging the cloud-based functionality of Cisco Meraki technology in a multi-carrier and multi-service provider environment. The CDAP works by collecting data from Mexico Conectado sites and converting it into relevant information that can facilitate measurement of the impact the country digitisation initiative is having. Specifically, the CDAP is designed to provide intelligence relating to the sustainability, social impact and support future fine-tuning of the initiative. The CDAP enables consolidation and/or correlation of data from a number of different management and use domains and transforms the data into analytics that can be used to measure key usability indicators for the country digitisation program. Analytics data provided includes the number of citizens using public Internet access, external/internal hotspot access distribution, bandwidth consumption and usage of government sites via public Internet. Nokia announced that it has been selected by the ALTÁN Redes consortium to design, build and operate a new national LTE and 5G-ready wholesale network in Mexico in what represents its largest contract to date in Latin America. Called Red Compartida, the shared network project in Mexico is an innovative program designed to provide wireless broadband coverage nationwide to 92% of the population, and thereby reduce the digital divide and strengthen the country's digital services capabilities. The greenfield deployment will utilise the 700 MHz frequency band. 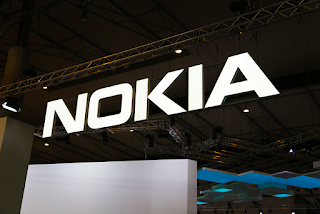 The contract with Nokia includes provision of the core of the network, including 100% of the fully virtualised core network and 40% of RAN, IP backhaul, OSS and NOC solutions. The Nokia equipment is to be deployed in five regions of Mexico, out of a total of nine, including Guadalajara and Monterrey, the second and third largest cities. The project also encompasses a range of services that mean Nokia will deliver a turnkey project, including site acquisition, construction, deployment, network integration, network planning and optimisation, master system integration (core network), operation and maintenance and managed services. Nokia will specifically supply solutions including a virtualised core network, VoLTE and EPC based on Air Frame, 4.5G Pro radio access based on AirScale, IP and optical backhaul systems, DWDM 100 Gbit/s and IP routing platforms for aggregation, and microwave transmission platforms. The Red Compartida project is a public-private international partnership led by the Mexican Ministry of Communications and Transport (SCT) and the Office for the Promotion of Investments in Telecommunications (PROMTEL), in coordination with the Federal Institute of Telecommunications (IFT). The project is expected to involve a total investment of over $7 billion over nine years, financed by international and local investors. ALTÁN Redes is a new wholesale carrier supported by international investors and Mexican shareholders that won the tender process to build and operate the shared network which will support the delivery of mobile and Internet services for existing mobile operators and existing and new MVNOs. 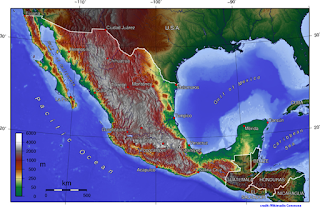 Rivada Networks has been disqualified from the bidding for Mexico’s landmark Red Compartida project, is an initiated by the Mexican government to build a wholesale LTE network operated on 90 MHz of spectrum in the 700 MHz band. In a press statement, Rivada said it "has complied with every requirement put before us by the Mexican government, despite the fact that the government repeatedly moved the goalposts on bidders in the final weeks and months." Telefónica Mexico will deploy more than 1,000 Ericsson Radio Dot Systems will be deployed in shopping malls, airports and commercial buildings in Mexico City to reinforce cellular coverage. 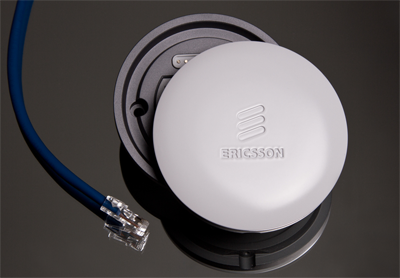 The units will support 4G/LTE and 3G/WCDMA indoor coverage. 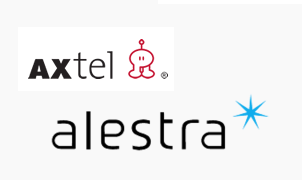 Alestra announced a merger agreement with Axtel, a fixed line operator based in Monterrey, Mexico. It serves 39 cities across Mexico with fixed line services, including FTTH, VPNs and integrated communications. Alestra is an IT services company based in Monterrey, Mexico. It operates five data centers across Mexico. It's parent company. Alfa, purchased AT&T's 49% in Alestra baci in 2011. AT&T last week confirmed plans to invest US$3 billion to extend its high-speed, mobile Internet service to Mexico, covering 100 million people in Mexico by year-end 2018. This is in addition to the US$4.4 billion AT&T invested earlier this year to acquire Iusacell and NEXTEL Mexico. Specifically, AT&T said the first phase of the mobile network will be complete in the next six months and cover 40 million Mexicans, about one-third of the population. By the end of 2016, AT&T expects its mobile Internet service will reach 75 million people, nearly two-thirds of the population. AT&T plans to reach 100 million people by year-end 2018. AT&T is preparing to introduce new plans around a North American Mobile Service Area, letting customers extend their plans across both countries. AT&T completed its previously announced acquisition of Nextel Mexico from NII Holdings for $1.875 billion, less approximately $427 million of net debt and other adjustments. The deal includes spectrum licenses, network assets, retail stores and subscribers in Mexico. Alcatel-Lucent is working with government of Mexico to trial LTE running in 700 MHz APT spectrum as the basis for a new national wholesale ultra-broadband mobile network initiative. The "Red Compartida Project" aims to provide a 4G LTE mobile broadband wholesale offering service in the Digital Dividend spectrum for both existing services providers and licensed tenant operators. The trial in the city of Acapulco uses Alcatel-Lucent’s LTE express solution for rates up to 120 Mbps and the company's latest Packet Microwave Radio solution as backhaul. AT&T plans to acquire Nextel Mexico from NII Holdings for US$1.875 billion, less the outstanding net debt of the business at closing. The deal includes spectrum licenses, network assets, retail stores and approximately 3 million subscribers. Nextel Mexico’s network covers approximately 76 million people. The Nextel Mexico assets will be combined with those of Iusacell, which AT&T recently acquired. 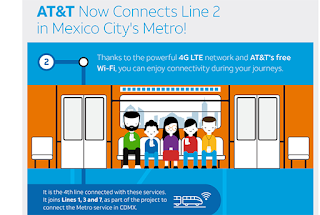 AT&T said its ambition is to create the first-ever North American Mobile Service area covering over 400 million consumers and businesses in Mexico and the United States. Regulatory approvals are required as is the consent of the U.S. Bankruptcy Court for the Southern District of New York, which is overseeing the restructuring of NII Holdings. Nextel de México is still using an iDEN (Integrated Digital Enhanced Network) over most of its territory. The carrier has launched LTE in Mexico City, Guadalajara and Monterrey. Earlier this month, AT&T completed its previously announced acquisition of Iusacell, a leading Mexican mobile operator, from Grupo Salinas for US$2.5 billion, inclusive of Iusacell debt. The deal includes all of Iusacell’s wireless properties, including licenses, network assets, retail stores and approximately 8.6 million subscribers. “The quick approval of this deal is one more example of why Mexico is an attractive place to invest,” said Randall Stephenson, AT&T chairman and CEO. “We look forward to bringing more wireless competition to Mexico along with an improved mobile Internet experience for customers. Expanding and enhancing Iusacell’s mobile network to cover millions of additional consumers and businesses is our top priority." AT&T agreed to acquire Iusacell, a leading Mexican mobile operator, from Grupo Salinas for US$2.5 billion, inclusive of Iusacell debt. The deal includes all of Iusacell’s wireless properties, including licenses, network assets, retail stores and approximately 8.6 million subscribers. 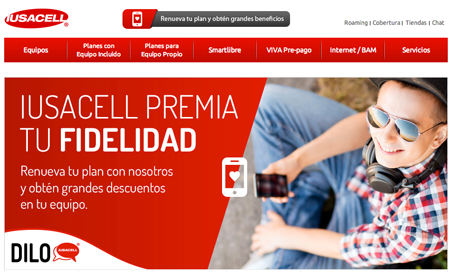 The acquisition will occur after Grupo Salinas, the current owner of 50 percent of Iusacell, closes its announced purchase of the other 50 percent of Iusacell that Grupo Salinas does not own today. Iusacell operates a 3G GSM/UMTS network based on the same technology that AT&T uses in the United States. Iusacell owns between 20 and 25 MHz of 800 MHz spectrum, primarily in the southern half of the country, including Mexico City and Guadalajara, and an average of 39MHz of PCS spectrum nationwide. Iusacell’s Total Play business, including the network assets to support pay TV and wireline broadband services will be spun out to Grupo Salinas’ existing shareholders prior to AT&T closing its acquisition of Iusacell. 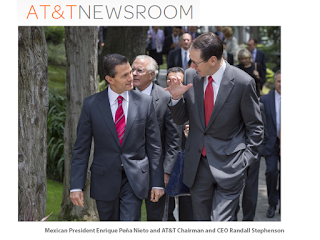 AT&T cited recent changes to government policies in Mexico that have created a friendly climate for foreign investment. AT&T plans to create a North American Mobile Service area for U.S. customers calling or visiting Mexico, and Mexican customers calling or visiting the United States. The transaction is subject to review by Mexico’s telecom regulator IFT (Instituto Federal de Telecomunicaciones) and Mexico’s National Foreign Investments Commission. In 2011, AT&T sold its 49% stake in Mexico's Alestra, giving ALFA 100% control of the firm. Financial terms were not disclosed. Alestra offers a range of business-class services, including converged communications, hosting and cloud capabilities. The company operates a 40 Gbps fiber network spanning 6,700 kms. across Mexico, including 1,750 kms of metro rings. América Móvil announced plans to sell the majority interest (over 50%) of its operations in Mexico in order to cease being a "preponderant economic agent" as defined by new laws intended to break up the telecom monopolies in the nation. 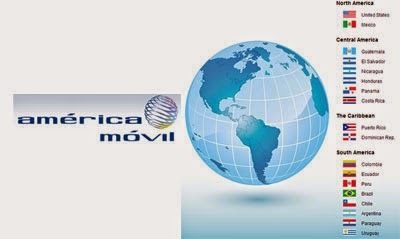 The intended sales concern América Móvil's fixed line business, TelMex, and its mobile network, Telcel. Carlos Slim is the largest stakeholder in América Móvil. As part of the plan, all cellular cites (base stations), including towers and related passive infrastructure, will be separated from Telcel so that they may serve on a wholesale basis to all interested parties. América Móvil's TelMex division also ratified a commercial agreement with Dish México in anticipation of offering pay television service once its regulated status as preponderant economic agent is cleared.